If there’s a wireless network around, you can connect your Droid X to that Wi-Fi network to access the Internet without using your 3G network. This can come in handy if you aren’t getting a good 3G connection, if you’re nearing the maximum on your data package, or if you didn’t sign up for a 3G data package for your Droid. From the Applications Tray, choose Settings→Wireless & Networks→Wi-Fi. 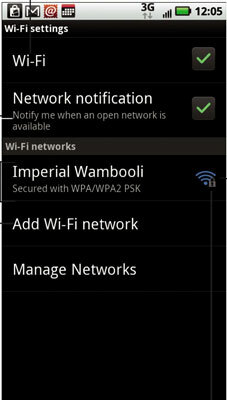 A green check mark appears by the Wi-Fi option, indicating that the phone’s Wi-Fi abilities are now activated. The name of the network you connect to appears on the screen. To actually join the network, choose Wi-Fi Settings. A list of Wi-Fi networks appears. If no wireless network is displayed, you’re sort of out of luck regarding wireless access from your current location. Select a network that you know you can access (either because it’s not password-protected or because you know the password). If you need to, type the network password. You may want to touch the Show Password check box so that you can see what you’re typing; some of those network passwords can be long. You should be immediately connected to the network. If not, try the password again. 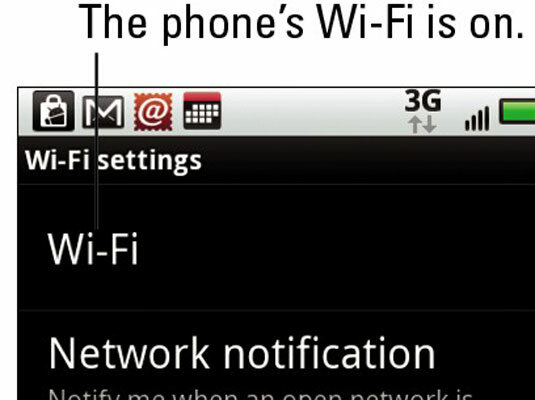 After your phone is connected, you see the Wi-Fi status icon appear atop the touch screen. It means that the phone’s Wi-Fi is on and that it’s connected and communicating with a Wi-Fi network. Some wireless networks don’t broadcast their names, which adds security but also makes accessing them more difficult. In those cases, choose the Add Wi-Fi Network command to manually add the network. You need to input the network name, or SSID, and the type of security. You also need the password, if one is used. You can obtain this information from whoever is in charge of the wireless network at your location — or the barista if you’re in a coffee shop. Not every network has a password. Some public networks are open to anyone, but you have to use the Browser to find a login page that lets you access the network: Simply browse to any page on the Internet and the login page shows up. The phone automatically remembers any Wi-Fi network it’s connected to as well as that network password. To change a Wi-Fi network password, touch the Wi-Fi network’s name and choose the command Change Password from the pop-up menu. A Wi-Fi network is faster than a cellular data network, so it makes sense to connect with Wi-Fi whenever you can. Unlike a cellular data network, a Wi-Fi network’s broadcast signal goes only so far. If you wander too far away, your phone loses the signal and is disconnected.